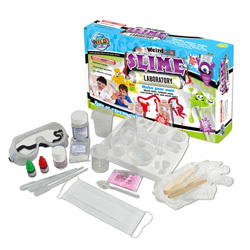 First up, we had The Weird slime laboratory, priced at £12.99, it’s aimed at boys aged 10+. 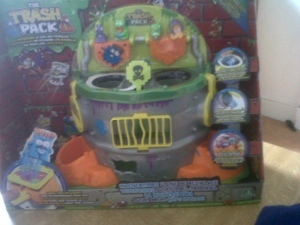 Toby absolutely loved this set, we made “fish eggs”, “jelly snakes” and his favourite, Fart putty. I was very impressed with this set, there were goggles and gloves included and a little booklet full of “recipes” and instructions. All in all, this is a very good set, it’s educational and fun and very reasonably priced. 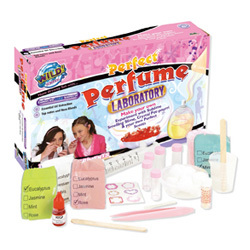 Next up we had the Perfume laboratory, also priced at £12.99, this is aimed at littles girls from the age of 8. This kit includes everything you need to make some really lovely perfumes, mint, jasmine, eucalyptus and rose. There were enough scent cards to enable you to mix and match and all the ingredients to make some pot pourri, we made jasmine scented pot pourri and the smell lasted ages. Again, a very good set, easy to use with good clear instructions. Taking pole position this Autumn, Micro chargers from Flair race at lightening speed at the extraordinary scale of 1:175. With innovative micro technology, these tiny vehicles can race at scale speeds of over 600 mph…incredible! 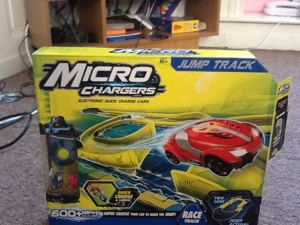 Charge them up in seconds, hit the tracks and get racing. My 9 yr old was sent the jump rack set(£24.99) and he couldn’t wait to set it all up, we were a little disappointed to see that, although there were 2 micro cars, there was only 1 charger, so that made racing a little difficult unless I went out and bought an additional charger. I’m always a little cross that batteries aren’t included in kids toys, the chargers require 2 aa size. The track itself was quite tricky to put together and patience was wearing thin, but, we did it in the end. Nice to see that additional tracks can be bought and that they all interconnect making one giant track. The trash pack from Flair launched back in January and already over 1 million have been collected. Now with a new series out, nauseous neon green changes to yucky luminous orange and the grossest gang in the garbage are back with some new additions to the pack. We were sent the Scum Drum Playset to review SRP £24.99. My 9 yr old loves collecting things and these little things made his day, there are loads of different ones to collect all with gross names, like Slime Bucket, Gutter Grub and Mouldy Mushroom to name but a few. Visit trash pack.com to find out more about this new collecting craze. 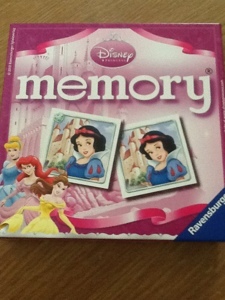 My 6 year old daughter was very pleased to receive this new Memory card game from Ravensburger. Mini memory is a set of 48 high quality memory picture cards, making 24 pairs. The game play can be adapted to suit different ages and abilities. The memory cards are are made from high quality card and are laminated on both sides. Each card measures aprox 5x5cm and are aimed at boys and girls from 3-5 years. We have all heard of ZhuZhu pets right? First there were hamsters, then cute little dogs and cats, now there are ZhuZhu ponies! Every little girls dream is to own a pony, now they can own their very own ZhuZhu pony. ZhuZhu ponies are adorable, they have long colourful manes and tails and come with their own accessories. 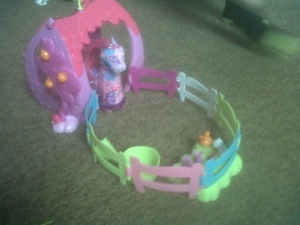 Also available from Character is the Pony Gable Stable Playset, which can interconnect to make a colourful stable row. 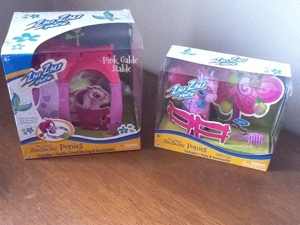 There are 6 ponies to collect and are aimed at little girls aged 4-8, the ponies are priced at around £14.99. My daughter absolutely loved her pony and the stable Playset, well worth the money in my opinion and batteries are included, which is a bonus. 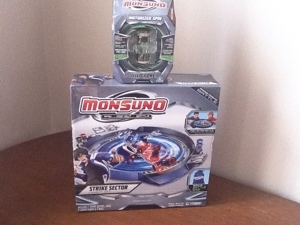 The lovely Sherri from PR Evolution sent us over a Monsuno set, consisting of a Strike Sector Combat set and a selection of cores, this new range of battle toys is aimed at boys from 6-10 years and is a lot like Pokemon crossed with bey blades in my opinion. The core is a collectible capsule with a high performance spinning action and a powerful Monsuno Monster concealed within, on impact with another core, the monster springs in to attack and is ready for battle. The strike sector combat set is a fast action battle with launch ramp for the spinning collectables and battling monsters. My boys loved this set and have had many battles, I particularly like the fact that the combat set snaps apart and folds down for easy transport, a handy little bag is included, which I think is fab, also included are collector game cards. Prices start at around £8.99 for a single core to £27.99 for a set of 4, the combat set is reasonably priced at £19.99 and is available from all good toy shops. The lovely Sherri over at Evolution PR has certainly kept me busy over the half term, not that neither I or the children are complaining. 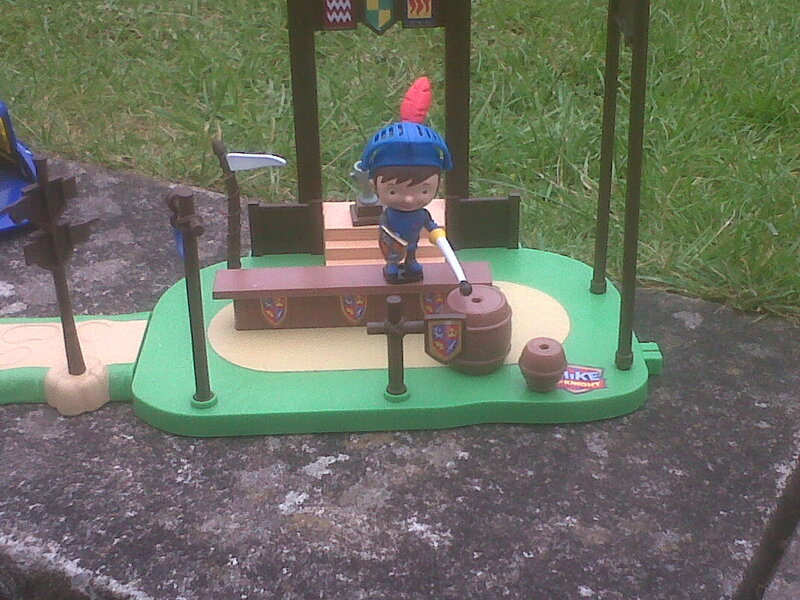 First off we have Mike the Knight and his Glendragon Arena Playset from Character Options. Mike the knight is a heroic top pre school TV show which has come to life off screen. Aimed at mainly boys aged 3-5 years. The playset includes Mike himself and various bits and bobs that enable him to do jousting and is great for recreating Mike’s medieval world, I personally would have liked to see his horse, Gallahad, but he is available to buy seperately at around £9.99, along with a few other playsets. New from Golden Bear’s 2012 range is Winning wenlock, a lovely 35cm plush, he is aimed at children aged 3+. 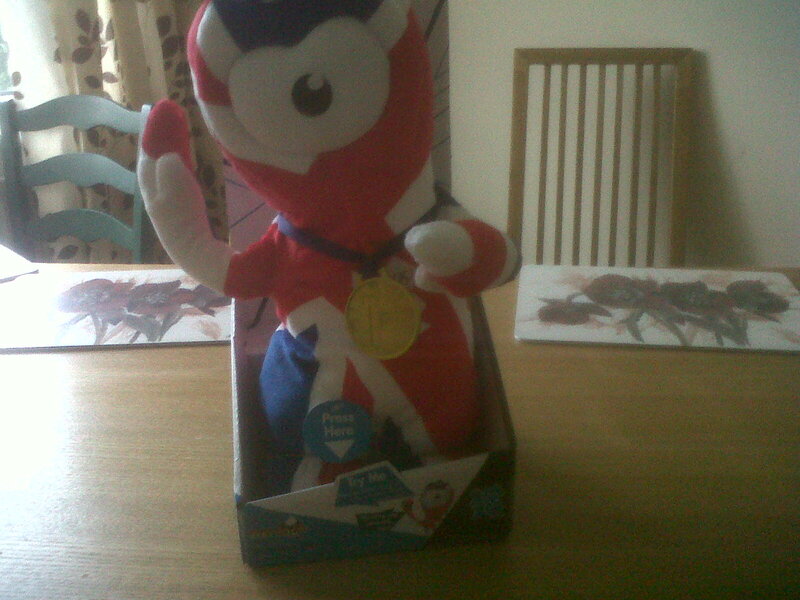 With the 2012 Olympic games fast approaching, Wenlock is the official mascot and with his poseable arms and catchy mascot song, he is a must to help us cheer along our sporting heroes. Priced at about £40, he is available at most good toy retailers. 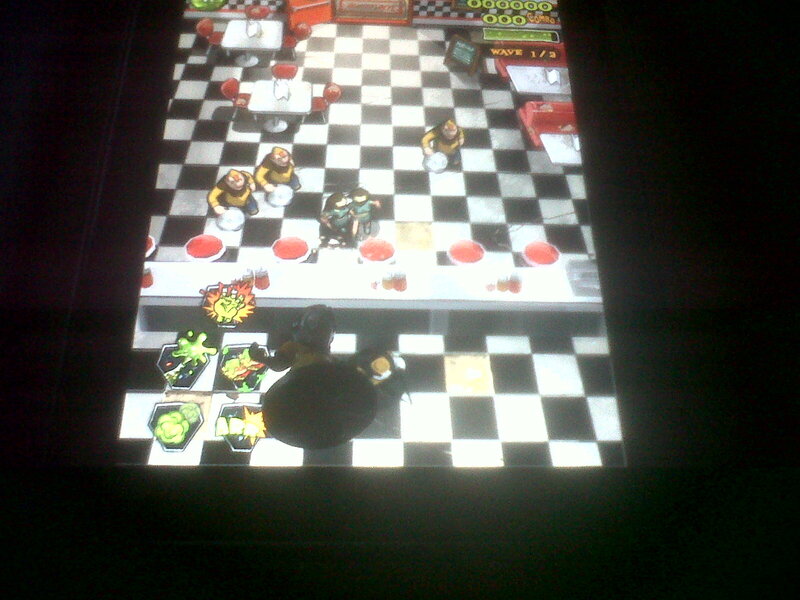 Lastly but by no means least , we have Zombie Burbz, an exciting new game for the ipad, where you in control of the zombies, who are good and just merely mis understood, The app itself is free and available in the app store, but you do need the zombies to play and they are around £9.99 . My 8 year old absolutely loves this game, and i think it is well worth the money, as it also comes with 3 collectable Zombies. Disclaimer: All the above products were sent to me free in return for an honest review.